To request a song you need to have a song request token that is given by donating any amount. Patreon subscribers have unlimited song tokens and can request songs whenever they want! Note #1: as of now, when requesting a song, make sure the stream is live so it can be played during the stream. 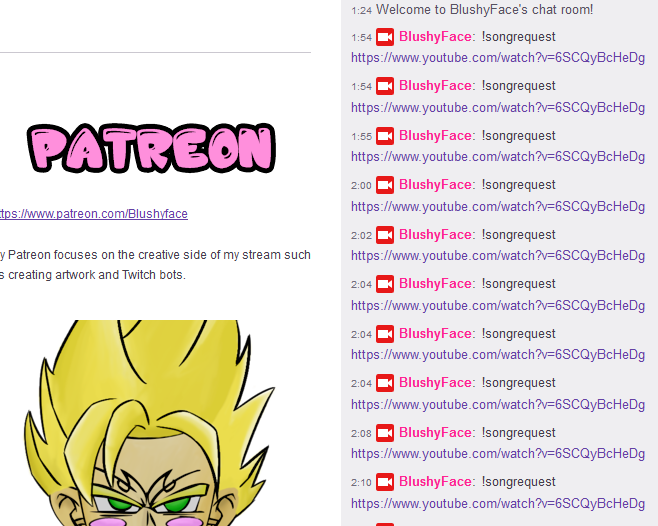 I will update the BlushyFaceBot to allow song queues even when stream is offline and every song request will be played as soon as the stream is on when i have the time to implement this feature. Note #2: If you want to make use of the song request feature for your own stream, you need to provide the BlushyFaceBot with a valid YouTube API key to enable song requests.